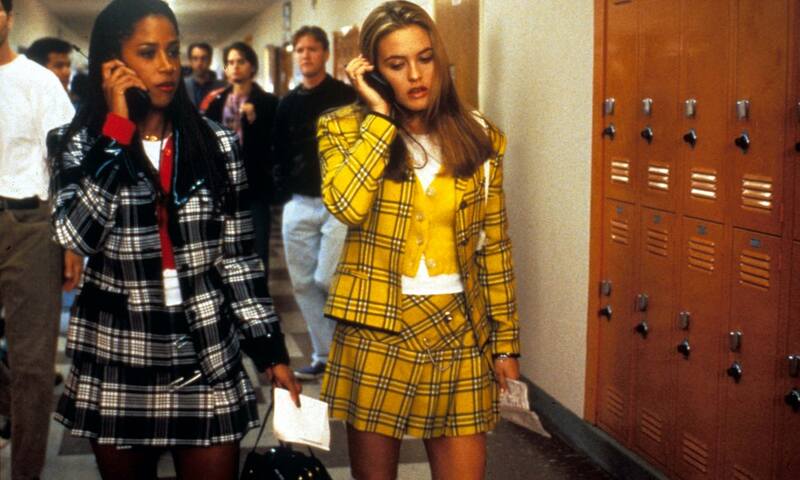 Clueless chic is back! I love a good check. It’s a classic wardrobe staple through the decades but choosing your check is key to making it fashion forward rather than 90’s throwback. Take me for example… I’m short and a little chubby around the waist, and an apple shape working out how to get back to pear… basically, I want to elongate my legs and distract from my round middle. Wide checks on my bottom half will make my legs look shorter, so smaller check squares work between on my bottom half. A very small check print won’t make my legs look shorter, but we can go one better and choose a medium check, with clean vertical lines to make my legs look slimmer and longer. If you choose a bolder colour for the trousers, it will enhance the vertical check lines and focus eyes on the new look longer legs. Result! If I’m wearing a dress, then a small check or medium check, with gathering just under the bust will work best. The fabric will glide over my middle and draw less attention to the parts I feel less confident with. Colour-wise, more muted tones or neutrals work best for checked/ plaid dresses for apple shapes. Pear shapes can use plaid checks to balance out the top half with the bottom. A wider check top, matched with a plain, dark coloured A-line skirt will work well. The larger checks widen the appearance of your top half, while an A-line skirt nips you in at the waist, while gliding over the hips. Checks can be a tricky look for taller people too and as a friend of mine said last week, she felt like the BFG when trying on a pair of wide leg plaid tailored slacks. The wide leg and small print made the look a little old fashioned. Sleek tapered trousers in a larger check would balance out longer bodies. Checked skirts (proper clueless style) look gorgeous on long legs, either mini or midi skirts work equally well. How do you feel about checks? Have you found the check that works for you? If I’d love for you to share your tips! Leave a reply on "How to rock A/W 2018 plaid"